STORRS - When UConn is getting good guard play, the Huskies are hard to beat. 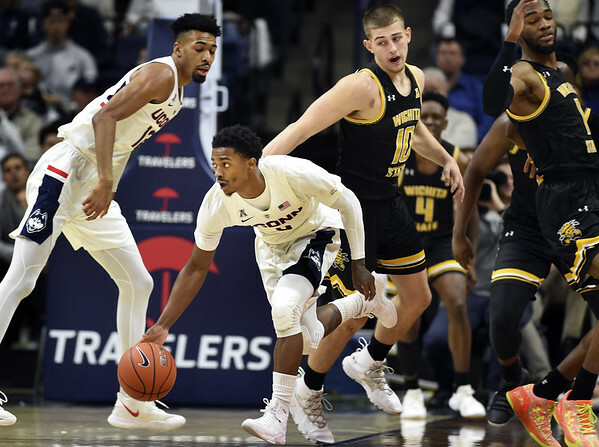 Christian Vital scored 21 points and Jalen Adams added 19 points and 12 rebounds Saturday to lead the Huskies to an 80-60 win over Wichita State in the American Athletic Conference. The pair combined for 16 baskets on 29 shots (55 percent), 17 boards, eight assists and just one turnover, by Adams. UConn stretched the lead to 19 early in the second half, before point guard Alterique Gilbert (five points, six assists), reinjured his surgically repaired left shoulder running in to a screen set by Morris Udeze and left the game. The Shockers cut the lead to 12 before the Huskies regrouped and put the game away, pushing their advantage to 26 points late in the game. Wichita State: The Shockers, who have been to seven straight NCAA Tournaments, were coming off their worst offensive game under Gregg Marshall, a 41-point effort in a 13-point loss to South Florida. They continued to struggle in this one, shooting just 34 percent, including 29 percent in the first half. UConn: Hurley said Gilbert's injury is not believed to be too serious, though he will undergo more tests and may miss the Huskies next game. ...Forward Mamadou Diarra, who has been out all season with a knee injury, saw his first action late in the second half and scored two points. UConn's highly touted recruit Akok Akok spent his first game on the bench as a second semester walk-on for the Huskies. Under NCAA rules, the 6-foot-9 forward won't be eligible to play until next season because he was recruited by the school and is receiving financial aid. He is practicing with the team with the expectation that he will play in the fall as a redshirt freshman. Polley was matched up on Wichita State star Markis McDuffie, who came in averaging more than 19 points a game. The Shockers star scored just nine Saturday on 4-of-14 shooting. Polley, who had been struggling offensively, was 4 of 8 from the floor, and made three of his five 3-point shots. UConn: The Huskies travel to Orlando for a game Thursday at UCF, which beat the Huskies by 12 points in Hartford earlier this month. Posted in Newington Town Crier, UConn on Saturday, 26 January 2019 22:06. Updated: Saturday, 26 January 2019 22:09.